A Help Desk App Built On WordPress? It’s been only just over a month since Jay and Mike released FaultPress – an advanced bug tracking application theme, but they didn’t just stop there, they went straight back to the drawing board, read all our community’s recommendations and suggestions and started developing a new, more general usage support theme catering for a wider range of niches. 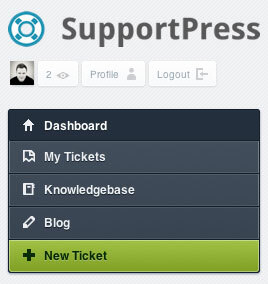 We are proud to release that theme today – introducing SupportPress. SupportPress, our second application style theme is designed to create a clean and simple, yet powerful help desk using WordPress core functionality. Customers can submit support requests, but are encouraged to check an intuitive knowledgebase to learn if their issues have already been resolved. Agents (your staff) administrate tickets by setting priorities and delegating tasks to fellow team members. The solution is perfect for web designers, hosting companies, app developers, training academies, to name but a few examples. It takes WordPress as a content management system and turns it into a basic customer relationship management system.